When we bought our house last year, I was so excited to finally get a dishwasher for the first time! But after using my dishwasher for a few months, my excitement started to wane because my dishes were not coming out clean. I was having to rewash half of the dishes. Ugh! 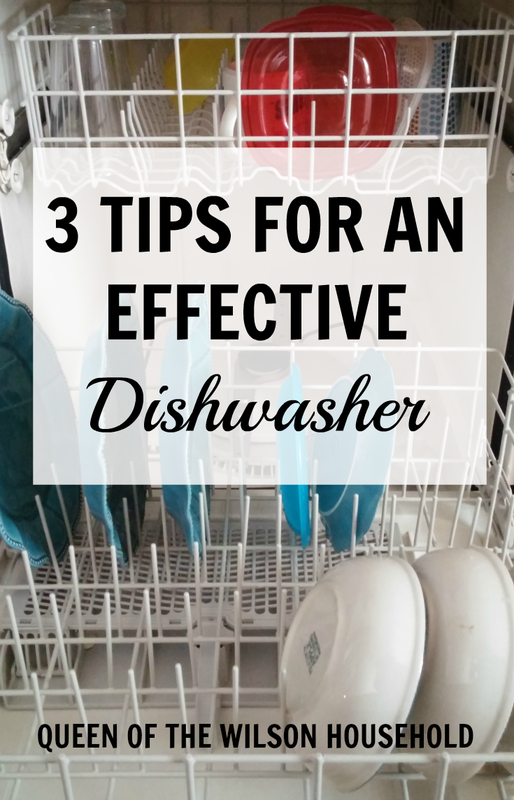 After much trail and error, I found 3 tips that make my dishwasher work much more effectively! The longer food particles sit on the dishes, the harder and more stuck on to the dishes they become. As soon as dinner is over, the dishes should be rinsed off. Instead of overcrowding, I have learned that I must leave some space between the dishes, especially plates, bowls, and pans. If you can see some empty space in your dishwasher that is best. The water needs a way to get to the dishes, and if the dishes are stacked close together it is hard for the water to reach all the dishes. Empty dishwasher of all dishes. Take out any removable parts from the dishwasher. For me that included the float, spray nozzle, and silverware container. Wash the removable parts with warm soapy water. While the parts are out, clear out any debris on the bottom of the dishwasher. I found a spoon that had been down there for who knows how long! Return the pieces to the dishwasher. Pour 1-2 cups of vinegar on the bottom of the dishwasher. When the cycle is done, wipe inside the door frame, around the edge of the door, and anywhere else that may have some grimy build up. Sprinkle baking soda on the bottom of the dishwasher and let sit for an hour or overnight. This helps deodorize the dishwasher. Check out my tip on how to get rid of film on dishes when using the dishwasher. Interested in making your own cleaning supplies? Check out my recipes. I was just thinking that I needed to give my dishwasher a good cleaning. Thanks for the step by step instructions, Emily! You're welcome, Kristen. It has really helped my dishes. I hope it does for you too!